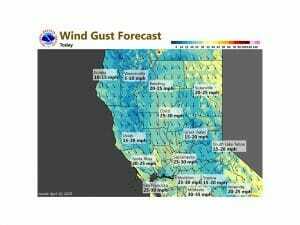 April 10, 2019 – Dry and breezy conditions today. Another system may bring some showers to the mountains Thursday and again early next week. Clear skies across the region early this morning in the wake of yesterday`s trough passage. Current temperatures are running around 3-8 degrees cooler compared to 24 hours ago despite steady north winds of 10-15 mph across much of the area and generally range from the 20s and 30s in the mountains to the upper 40s to mid 50s across the Central Valley. Ridging from the eastern Pacific edges over NorCal today for dry weather and slight warmer temperatures. Breezy north winds will continue today, but won’t be quite as strong as Tuesday. Next short-wave slides down from the north on Thursday bringing a return of shower chances to the mountains along with slightly cooler temperatures. A few inches of snowfall accumulation will be possible across the higher elevations of the northern Sierra Nevada Thursday afternoon and evening. Strong ridging forecast to move overhead NorCal Friday into Saturday resulting in dry weather with milder temperatures. A weak disturbance will bring some light precipitation to mainly mountain and foothill areas during the day Sunday. Dry weather is expected in the Valley except for a slight chance of rain over the northern Sacramento Valley. A stronger shortwave approaches the area Monday into Monday evening bringing better chances for wet weather to NorCal. Ensembles still keep some lingering precipitation chances through Tuesday. Temperatures look to drop below average with this system Monday into Tuesday, with Valley highs topping out in the low 70s and upper 60s. No significant impacts are expected with this storm. Models and ensembles are trending towards dry ridging by mid next week.